He was a strong, energetic, active young man. But now, suddenly, he was suffering from agonizing pain! He had so much right lower back pain that he stood bent forward and stooped to the right. He was unable to stand or walk erect. His friends said he looked like a “little old man.” Also, he was sleeping poorly at night. He awoke often in search of a comfortable position. Usually, by bringing the right knee to his chest, the pain improved and he could doze off again. He endured the discomfort for several months. Heat, ice, liniment, shoe inserts, pain medication and health care practitioner adjustments brought only temporary relief. After sleepless nights and painful days, his energy was down at work and so was his productivity. Life was a pain! Sound familiar? For many, comparable pain is an everyday occurrence due to poor conditioning, stress, weak muscles and a sedentary lifestyle coupled with bursts of over-use and repetitive or sudden movements. When such “slip-ups” happen, muscle spasm and pain often occur. Multiple treatment methods are tried, often to no avail. But, there is a simple yet highly effective solution without drugs, surgery or even a trip to the doctor’s office – it’s called the FOLD and HOLD method. Many people believe that pain happens when a bone pinches tissues or a nerve, or when it rubs up against another bone; however, muscle spasm – which keeps a muscle from stretching or contracting properly – is often the chief culprit. A structural, mechanical dysfunction of the body occurs. By using the FOLD and HOLD method, pain caused by a muscle spasm can significantly improve and often completely erase by gently relaxing the “angry” muscle. This allows the body to re-align itself painlessly. 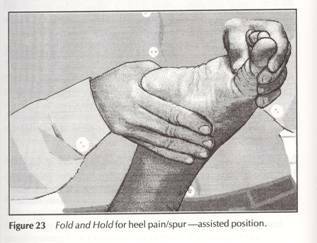 The FOLD and HOLD method involves reducing the palpable pain in the tender spot. This is done by shortening and, thus, relaxing the involved muscle by FOLDingthe body over the tender spot. In this FOLDed position, the tight muscle sleeps. HOLDing this comfortable position for a minimum of 90 seconds permits the muscle to get a good long rejuvenating sleep. And, it will awaken in comfort, provided the return to the normal position is done so slowly. A slow, return is critical because moving too quickly can re-provoke the offending muscle. You can do it yourself – no need for tests or “fixes” from physicians, physical therapists or chiropractors. It’s comfortable – remove your tender spots by finding a non-painful position. It’s convenient – can be done anywhere, anytime. It provides extended pain relief by treating the cause of the pain, not the symptom. It requires no drugs, dietary supplements, special instruments or machines. While this technique will work for a variety of different muscle aches and pains, three of the most common areas are lower back pain (as in the office worker above), tennis elbow and heel spurs. Lower back pain – Occurs in those who sit, crouch or kneel with the knee toward the chest for an extended period of time. Symptoms: In this position, the large Iliopsoas muscles that function to lift the thigh and/or bend the back forward is shortened and profoundly relaxed. With sudden standing, the abruptly startled muscle goes into spasm. The pain is aggravated additionally by lifting or straightening the leg and also by straightening the back. A tender spot, if found, is in the front of the abdomen above the public bone. However, it’s often not felt because of the muscles’ depth or abdominal girth. FOLD and HOLD: FOLD by bringing the knee to the chest. This can be done by lying on the back and holding the knee to the chest, by sitting in a chair with the knee held to the chest or while sitting with the chest resting on the knees. Adjust the knee to find the ultimate position of ease. This position may appear awkward, but it should feel comfortable. HOLD this position for 90 seconds. The spastic muscle is napping. 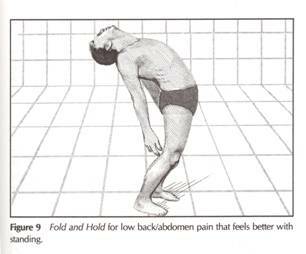 Release slowly, stand up straight and gently arch the back and stretch the leg backwards causing a slight pull in the groin. If you feel better, repeat three times a day for three days … if it’s not feeling better or if feeling worse, do not continue. A muscle may not be a cause of the pain and other professional help should be sought. Tennis elbow – Pain on the thumb side of the arm, or the “funny bone”. Symptoms: Pain occurs on the outer back or outer front of the elbow region. The pain is often aggravated when you straighten or twist the arm outward or when you flex the wrist, forearm and elbow. Grasping objects is weak and pain occurs with turning doorknobs or screwdrivers. Any activity that loads by working or stretches the extensor muscles of the forearm causes pain. 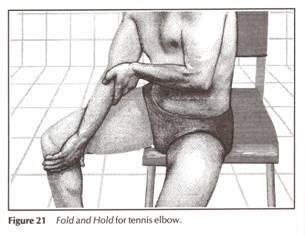 FOLD and HOLD: Find the tender spot, which is usually just behind the outer back side or outer bony prominence of the elbow. Feel along the backside of the elbow first. If you don’t find tenderness there, keep moving toward the front, and then to the forearm and wrist. Sit in a chair. Fully extend the arm and twist it outward. Place your thumb and palm on the inside of your right knee. The thumb pointing down, the palm facing out. The knob of the elbow should point toward the center of the body. Using your left hand, cup the elbow on the backside and push up and outward to the right, extending the elbow. You might feel an uncomfortable stretch sensation in the front of the arm. If comfortable HOLD for 90 seconds, release slowly. And finally, stretch by fully flexing the elbow and the wrist. Heel pain/heel spur: Plantar fasciitis – Common, crippling, frustrating problem for many that develops from no apparent injury. Symptoms: Pain on the bottom of the foot at the front edge of the heel bone. Pain is usually present and severe at first weight bearing in the morning, and gets worse with prolonged standing and walking as the day progresses. The problem is often a tight muscle that flexes the toes. The flexor digitorum brevis attaches at the spur area of the heel bone. But the spur is not the problem; it is the result of the tight muscle pull. The tender spot is easy to find! FOLD the bottom of the foot by pushing the heel toward the toes and the toes toward the heel. HOLD for 90 seconds. Slowly return and stretch the bottom of the foot. Wear good arch support, soft soled shoes. There you have it … three of the most common muscle aches and pains, and the simple, 90-second FOLD and HOLD method to solve them. To keep muscle spasms from returning, and to keep muscles strong and healthy, it’s important to maintain a healthy diet and exercise and stretch on a routine basis. 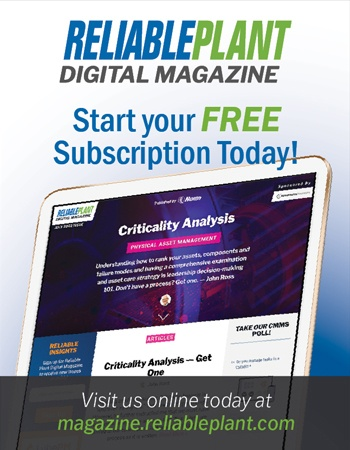 Dr. Dale Anderson is the author of “Muscle Pain Relief in 90 Seconds – The FOLD and HOLD Method,” (Wiley and Sons) and a notable, popular and entertaining speaker who practiced medicine for nearly 50 years as a family doctor, board-certified surgeon and board-certified emergency physician. To learn more, call 651-484-5162 or visit www.acthappy.com.